I just got back from seeing ... an elderly man (80 or so?) who had his portrait done by Judy Carducci. It literally knocked my socks off and I am now in a portrait induced trance. All I can say is "Wow." And, the client is of course thrilled. He loved the whole experience of working with her and now wants to have his lady friend's portrait done. I had a wonderful experience with Judy Carducci the week prior to Easter. She came for a double head and shoulders, then finished up doing another double head and shoulders of two large white German Shepherd dogs and two single head and shoulders of a lady’s grandchildren who were visiting for Easter (Anna and Lily). Judy “went with the flow”, worked from life for all of them and pleased all the clients immensely. "I so enjoyed you and sitting for you... I learned so much about...the technical aspects of drawing as I sat in pose and listened to you... You have a strong, and also gentle way about you and way of instructing.... I feel so fortunate and ...so blessed to have had the opportunity to meet you and spend that time with you. As I viewed your work...I've felt overcome with emotion - the ways you capture all forms with such beauty touches my heart. Awesome - just wonderfully, awesomely wonderful!" A discussion with the client clarifies what size and complexity the portrait will be, how formal or informal, where it will hang and what the sitter will wear. The time and place for the sittings is also arranged. If a complex background is planned, such as an interior with furniture, photos may be needed for details. A "sitting" is normally a 3-hour block of time. Within that time period, the sitter and artist take rest-breaks as needed. In the case of a multiple-sitting portrait, the first session establishes the pose, composition, and block-in. Clothing and still life items may be left for the artist to work on in the absence of the sitter. The paintings are done from life (although photos may be used for references in some rare instances), for several important reasons: the relationship that develops between the artist and sitter, and the opportunity for better personal observation are important to the pose and the expression; natural color in natural light cannot be obtained from photos; photos distort essential elements such as light and shadows and perspective; the sitter has the experience of participating completely with the artist in the creation of a work of fine art; the sitter sees the entire process and never has to reconcile the "picture in his head" with the final painting; friends or relatives can also be present and watch the process. A full-length mirror is positioned so the sitter can see the portrait progress on the easel. Children, as well as adults, enjoy the experience. Children sit as long as is comfortable for them depending on age and attention span, and have snacks during rest breaks. If old enough, they may control the timer and keep track of when rest periods will come. Children may choose videotapes from a variety available in the studio and watch them while posing; or parents or aunts or uncles may read to them if they would like. But many children prefer to watch what is happening in the mirror. 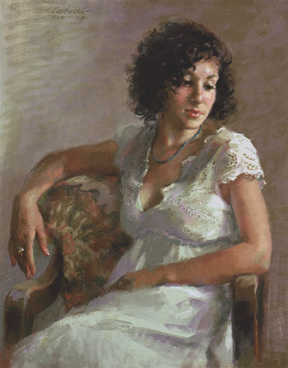 Portraits can either be done at the artist's studio or at the client's home or office. The artist's studio is located in a beautiful historic town, adjacent to the Cuyahoga Valley National Park, with several lovely inn/guest houses nearby as well as many hotels and motels. The Cleveland Orchestra's summer and winter homes are both within easy drive, as well as theaters and excellent restaurants and the Rock and Roll Hall of Fame with its stunning building by the famed architect I.M.Pei. So it is ideal for a family vacation to include family portraits. After the sitting(s), the work is completed back in the artist's studio, where final refinements and aesthetic adjustments can be made without the model's needing to be present. The work is then either shipped or delivered to the client. While the price structure is for unframed work, the service includes consulting about framing. If desired, the artist can select a suitable frame within the budget of the client. Note: Still life commissions are also possible, incorporating treasured objects.